Business premises on North End, vacant as of April 2019. 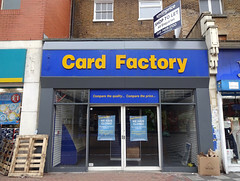 It was previously a card shop called Card Factory photo, but this closed down some time between January and April 2019. Its branch along the road at numbers 83-85 remained open. Last edited 2019-04-14 15:15:13 (version 35; diff). List all versions. Page last edited 2019-04-14 15:15:13 (version 35).